The very day my folks moved here from West Virginia in 1951 there was work to do - cows to milk, eggs to collect, livestock to feed. I was 18-months old. They'd bought a subsistence farm - large enough to feed a family and yield a "cash crop" to be sold for the payment of fixed expenses and the purchase of necessities not produced on the farm. I was farming by the age of 12. Dad used a team of horses , later upgraded to a team of mules, to work the farm before he purchased his first tractor in 1962. He felt that, as the eldest son, I should learn to work a team as he had growing up on a large farm in Kentucky. It was the most rewarding experience I've ever known, a real sense of accomplishment in being bone tired at the end of the day. When there was need of lumber - to build or to repair - Dad took me, an ax and a cross-cut saw to the woods out back. After the trees - usually poplar - were felled, we'd "snake" them out of the woods using the team, load them on a truck and haul them off to a small sawmill to have the lumber cut. Dad could notch and drop a tree with uncanny accuracy. As I got older the notching - which determines how a tree will fall - was left to me. Dad would walk out a ways and place a stake in the ground. The idea was for the tree to fall and drive the stake into the ground. I never did drive the stake in - but I scared it a time or two. Fall was time to harvest potatoes, onions, and other root vegetables for storage in the root cellar, and the time to cut and stack wood for heating over the long, cold & snowy winter. Grandma Ollie (who lived with us), Mom, and my sister did the canning. We gathered hickory, walnut and beechnuts to be cracked and eaten before the warm fire on those winters' nights. Snowstorms closed the roads - and there was no school for Sue, me or David for a week at a time. TV offered 3 channels: "Saturday Night at the Movies" was a big deal. We all became avid readers. Perhaps we were deprived, but we didn't know it. 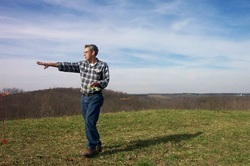 The photo of our home shown above is on the land (the south 40) that Mom & Dad deeded to me. 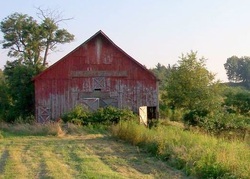 At various times, the place that Pat and I call home was pasture or fields of corn, oats or wheat. I still remember the thresher moving in at harvest time thought I was only about 5 years old at the time. The original home I grew up in still stands just north of us. After Mom's passing in 2009, my sister inherited the property. With our individual experiences of "life in the big city" - I'd lived in several metropolises after leaving Jackson to join the Marines at the age of 17 - and Pat's from Chicago - we decided to return and retire to my home here in Jackson. I was standing on the high and windy hilltop that was to become our home. Pat ran with the idea of "Everett's land" - and shortened it to become: "Ever"land Farm." That's why you'll find us at: www.everlandfarm.com.